To troubleshoot the Lexmark pro715 printer issues, all you need to do is to reboot your printer and then try a print job. The hard reset helps to resolve most of the Lexmark pro715 troubleshooting issues. The hard reset is nothing but resetting the hardware accessories in the printer. It can also be said as a full printer reset. You can reset your Lexmark pro715 printer in many ways. Some of the methods which will help you to reset your Lexmark pro715 printer easily are discussed below. Ensure the electrical cord is plugged into the printer and the printer is active. Confirm that the printer is securely connected to the computer devices, print server, or network access point. Check if the printer displays the error paper jam and resolve it. Check the ink cartridge level for your Lexmark pro715 printer. Load the paper, and install a new ink cartridge into the printer if necessary. Power off the printer, hold it for few seconds, and then wake it up. Make sure that your device (computer) meets the minimum requirement a system needs for the software installation. Remove and reinstall the printer software. Step 1: Read in detail about Lexmark pro715 troubleshooting solutions. The poor quality at the edge of the page, streaks or lines on printed image, slow print speed, and slowing down of the computer when printing are the most occurred troubleshoot issues on the Lexmark pro715 printer. Step 2: Check the print setting on your device. Enable the Borderless print feature on your computer. It helps to resolve the poor quality at the edge of the page. To enable the Borderless print feature on your devices, follow the steps given below. Step 3: For Windows, check out the steps given here. Open the document or photo you wish to print and click File—>Print. Click the Properties, Preferences, Options, or Setup option, navigate the cursor to the Paper or Finishing tab, select a Borderless setting, and then finally select OK. Click Print. Step 4: In Macintosh devices, open the image or document you wish to print, click File, then select Page Setup. From the Format for pop-up menu, select your printer. Select the paper size option from the Paper Size pop-up menu which shows Borderless in its name. Step 5: After selecting the Borderless option, click OK. In the menu bar, select File then click Print. Next, in the Printer pop-up menu, choose your printer. Choose Quality & Media from the print options pop-up menu. In the Paper Type pop-up menu, select a paper type. Step 6: Select Best or Photo from the Print Quality pop-up menu and click Print to confirm the action. 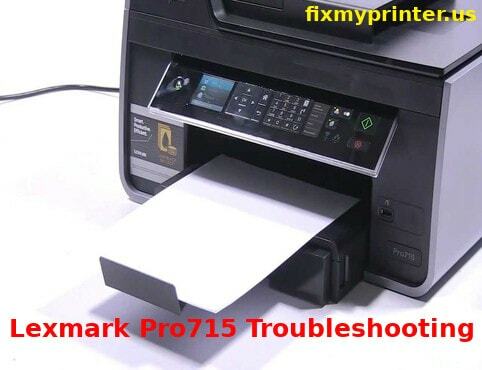 Look the print output to know if the Lexmark pro715 troubleshooting issues are resolved or not. To fix streaks or lines on the printed image, go to the method given. Step 7: Try to replace the low or empty ink cartridge in the printer. In the Printer Software, choose the High Print quality option. Ensure that the ink cartridge is installed correctly. If the ink cartridge is not inserted correctly, then go to the manufacturer’s site to get the guided instruction for the cartridge setup. Step 8: If the printer takes more time to finish the print job, then it is another issue. In the Printer Software, select the Lower Print Quality option. Select the paper type option manually that matches with the paper type you are using. Step 9: Try to delete and reinstall the printer software on your devices. Close all the application which are not in use, and minimize the number & size of graphics and images in the document to increase the computer processing speed. Step 10: Increase the memory on your computer. Updating the RAM helps you to add extra memory space on your computer. To resolve the computer slowing down issues while printing, try to check the USB connection between the printer and computer. If the current USB cable does not work correctly, then try using a different USB cable and follow the above mentioned Lexmark pro715 troubleshooting manual.